Adam Little was too good for Reece MacMillan last time out in September. Picture: K-G Zahedi Fougstedt. Trainer Michael Jennings believes Adam Little will cause a shock or two when he gets his chance to shine. The Kirkham super lightweight, 18-2, got back to winning ways last September when he stopped late replacement Reece MacMillan in four rounds on the World Boxing Super Series show in Liverpool. 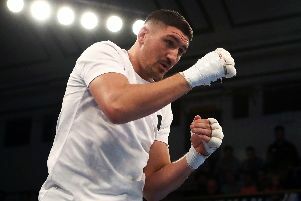 The 27-year-old has not fought since but has linked up with a new manager in Joe Gallagher who boasts an impressive stable of fighters including Anthony Crolla and the Smith brothers Callum, Liam, Stephen and Paul. “To me, Adam is someone who has slipped through the net when he shouldn’t have done,” said Jennings, who trains Little at Jennings Gym in Coppull. “If people had spent more time with him earlier in his career he’d be further on than he is now. “If you look at Adam’s record he doesn’t look like a big puncher but trust me Adam can punch. Gallagher has plenty of links to the Matchroom stable meaning there might be an opportunity for Little to feature on some of Eddie Hearn’s major Sky-televised fight nights. A former English welterweight champion, his victory over Morecambe’s MacMillan is his only fight since defeat to Glenn Foot back in December 2016. “We’re just waiting for a date,” said Jennings, who also trains Stalmine’s Jack Arnfield. “Joe’s got a lot of connections with Matchroom Boxing, most of his fighters are with them. “It’s great to be working with Joe and he’s looking to get him on some of the big bills. That might have to come in the away corner though, but Jennings is backing his man to get the job done whatever the circumstances, knowing making the most of an opportunity could be exactly the springboard his career needs. “Joe said ‘you might be an opponent are you happy with that?’,” said Jennings. “We said ‘definitely, Adam will be ready’. “We’re not bothered with how the opportunity comes. “He’s training all the time and is dedicated to the sport. “Nine times out of 10 we’ll be the away fighter but it’s brilliant to be the away fighter. “Look at Jack Arnfield, he was the away fighter against John Ryder and beat him a couple of years ago.